On 12 January 2016, a practical seminar on creation of centers for administrative services (CAS) in united territorial communities took place in Kyiv. The event was organized by the Ministry of Regional Development, Construction, Housing and Utilities of Ukraine together with the project of German International Cooperation Agency (GIZ). The opening of the event was attended by the representatives of respective ministries, including Genadiy Zubko, Vice Prime Minister of Ukraine/Minister of Regional Development, Yulia Klymenko, Deputy Economic Development and Trade Minister, and Wolfgang Bindseil, Deputy Head of Mission at the Embassy of Germany in Ukraine. Among the participants invited to this discussion were the experts of the joint EU/UNDP Project “Community Based Approach to Local Development” (CBA) Olena Ruditch and Oleksandr Riabyi. The invited experts discussed how to facilitate the creation of CAPs in united territorial communities and to ensure that the services provided by these structures really meet the needs of the population; they also discussed how to ensure timely and effective rendering of services and to improve the quality of services. During the discussions, the participants used the model of ideal CAS put forward by the organizers; according to this model, CAS services should be result-oriented, convenient, timely, simple, accessible, transparent and professional. The participants also discussed the conditions necessary for effective cooperation between the central executive authorities and united territorial communities in terms of provision of administrative services. A separate discussion was dedicated to reforming of the system of providing administrative services (legislation, national network of CAS and e-services). 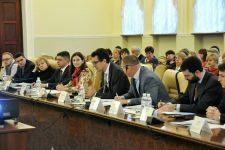 The experts from the GIZ Project also briefed about their project focused on governance reform in the area of administrative services implemented in the Eastern Ukraine that could be useful to other oblasts.